If you keep a personal diary by simply creating text files and storing them in folders, you could miss out on some features that will make your life easier. One of the best examples is Mini Diary, due to its simple and efficient design. Unlike other diary applications, which swarm you with all sorts of tools that you'll never use, this piece of software keeps everything simple. It lets you write personal entries for each day, and it makes them easy to find. If you're only interested in keeping a log of your daily activities or thoughts, this lightweight application is an excellent choice. 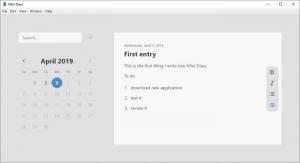 Mini Diary is a freeware application, so you don't have to pay for anything. You can have it up and running on your Windows, Linux or Mac OS X machine in no time, without going through any complicated options. The software doesn't require any special tools or services, and you won't notice any impact on your computer's performance. The software has a clean and simple user interface, with a layout you can get used to from a first glance. The left half of the window consists of a calendar, on which you can pick a day, and the right half is where you can write down whatever you can think of for the selected day. Additionally, you can add titles to your entries, make your text or parts of it bold or italic, and add bullets or line numbers if you want to create a To-do list or something similar. If you're looking for a particular entry in your diary, you can use the search box above the calendar. The software is capable of locating entries based on contained words, so not only can you search by entry titles, but you can also type any word from the main text to locate all the entries that contain that word. The results are listed in the same place as the calendar in a clear manner, so you won't have any kind of problems finding what you need. The software doesn't have a large number of options to go through, which is actually good news if you're only interested in keeping a journal. The interface and the few controls it presents are quite comfortable, and there is also a dark mode you can activate, to avoid eye strain. Furthermore, the application lets you set up a master password, to protect your personal entries from prying eyes. When it comes to keeping a diary, Mini Diary hits its mark remarkably well with its simple and straight-to-the-point design. You can easily keep daily journal entries. The software comes with a simple, yet efficient search function. It also password-protects your diary, to prevent other people from reading your entries. There are no serious drawbacks to point out. You can download Mini Diary free here.